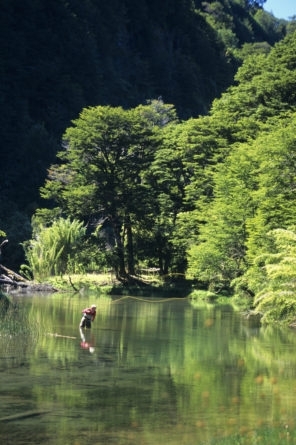 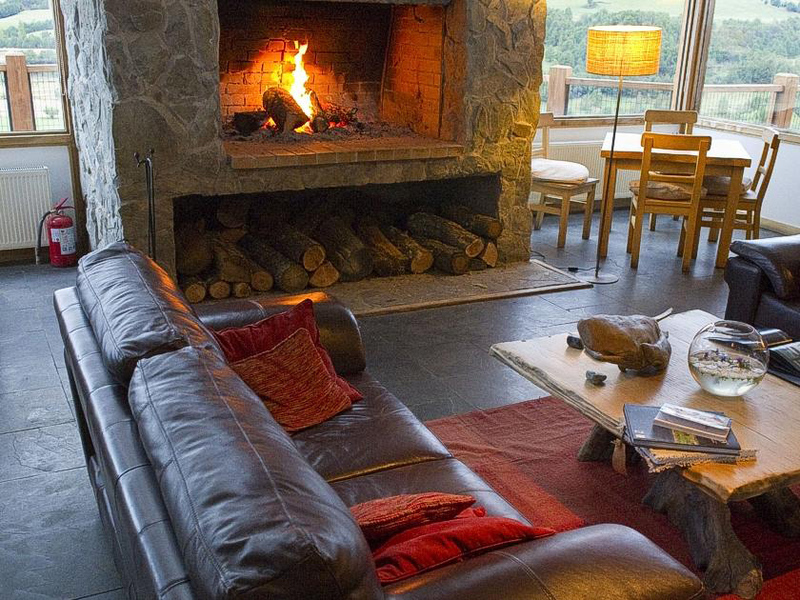 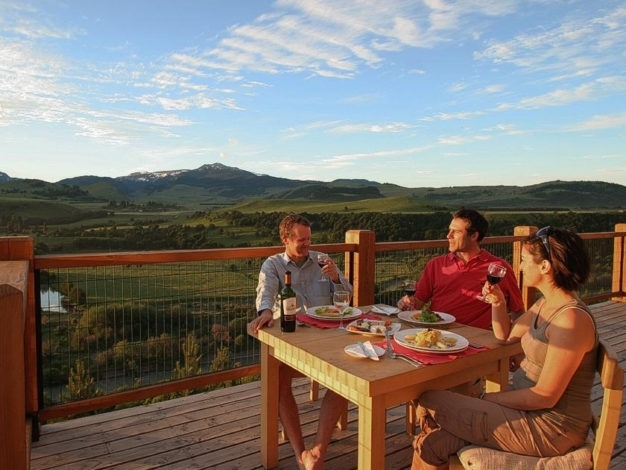 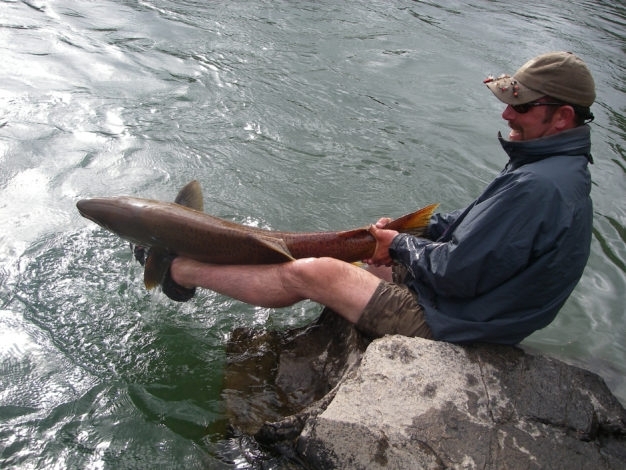 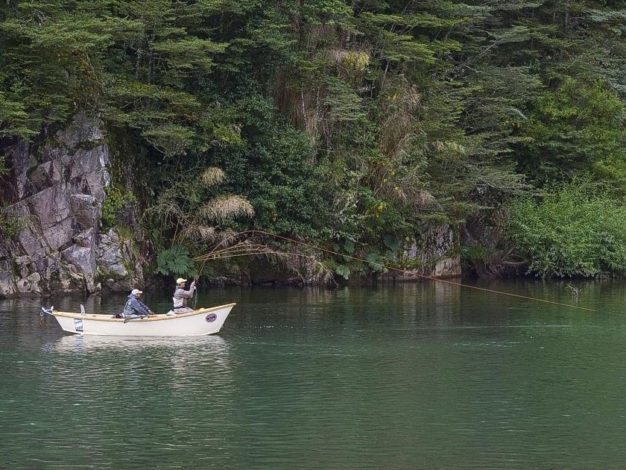 Cinco Rios Lodge on the banks of the Simpson River, just outside the small mountain city of Coyhaique, is the classic Chilean Fly Fishing Lodge. 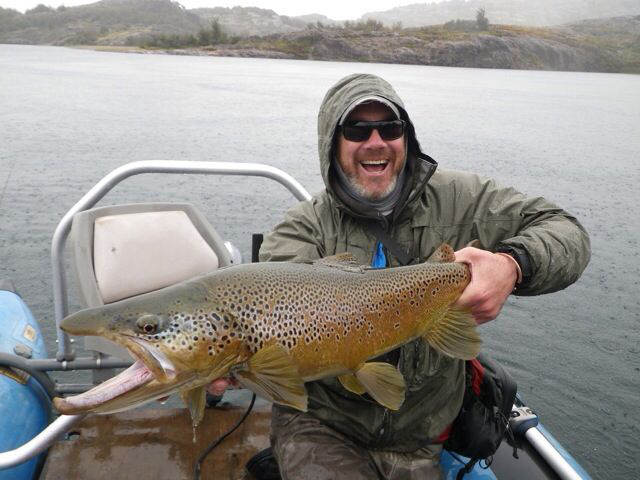 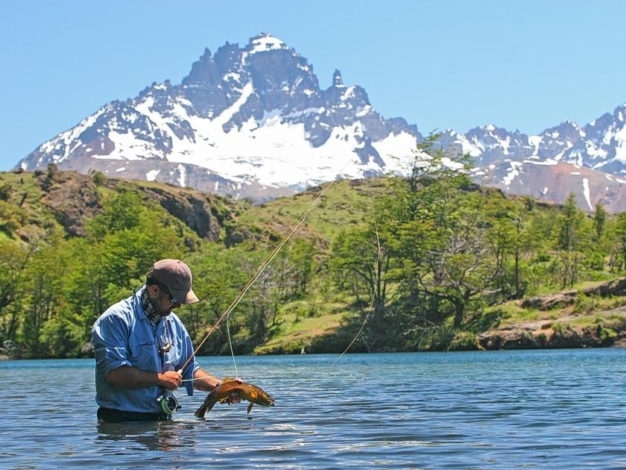 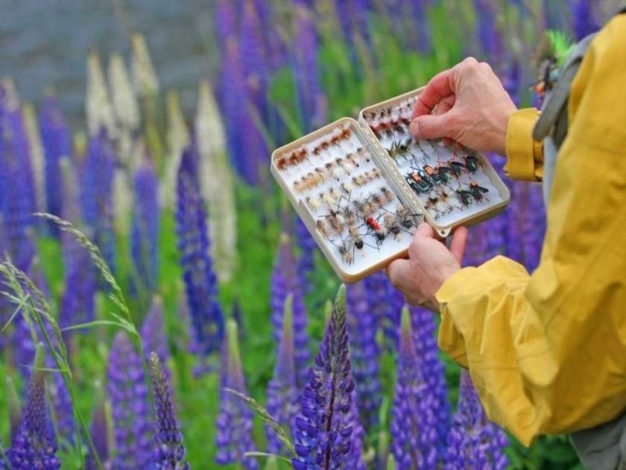 Centrally located in the midst of a truly astounding diversity of waters, anglers visiting Cinco Rios enjoy the best of what Chilean Patagonia has to offer. 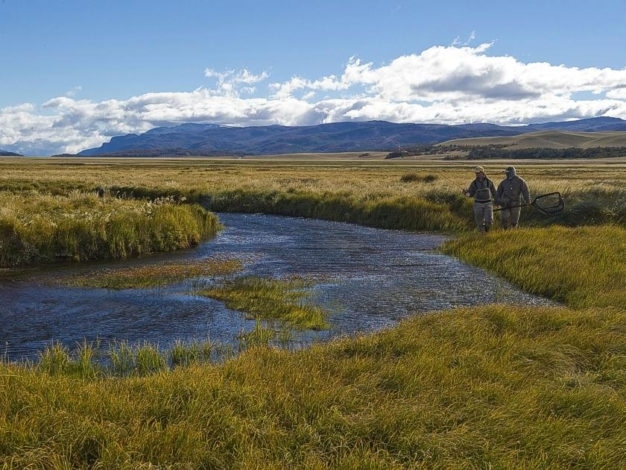 Everything from tiny spring creeks to full sized Andean rivers on both sides of the border (Argentina and Chile) with exclusive access await guests of this historic operation. 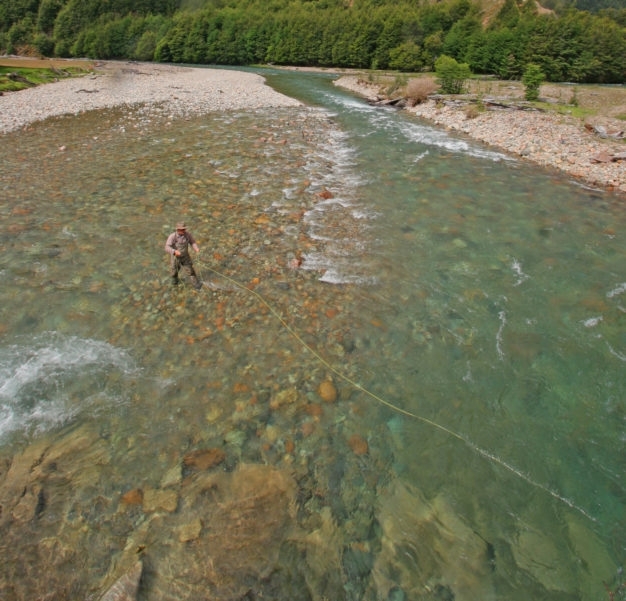 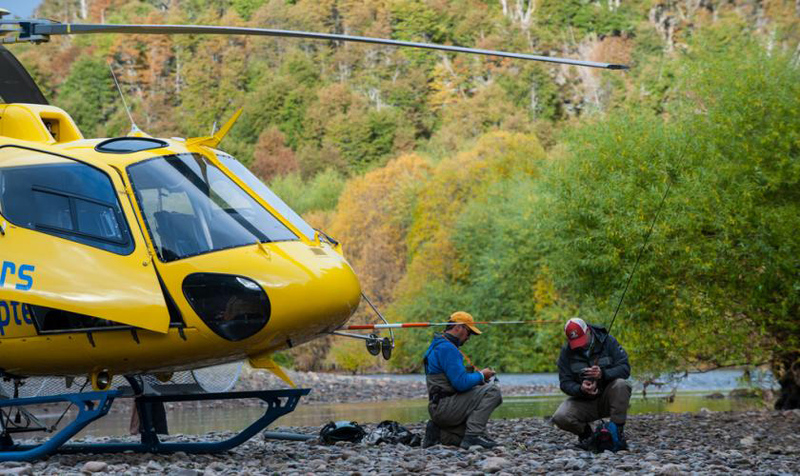 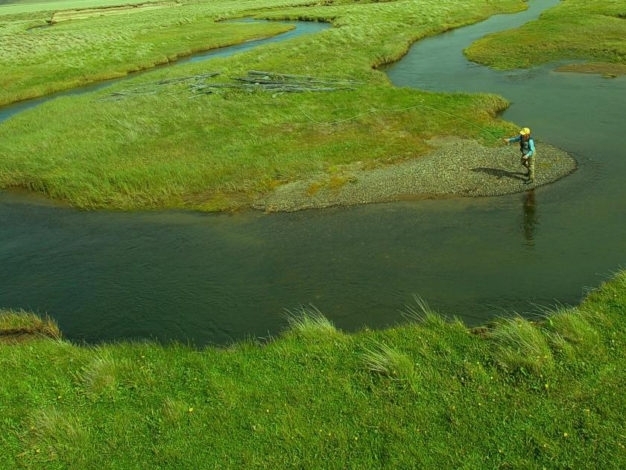 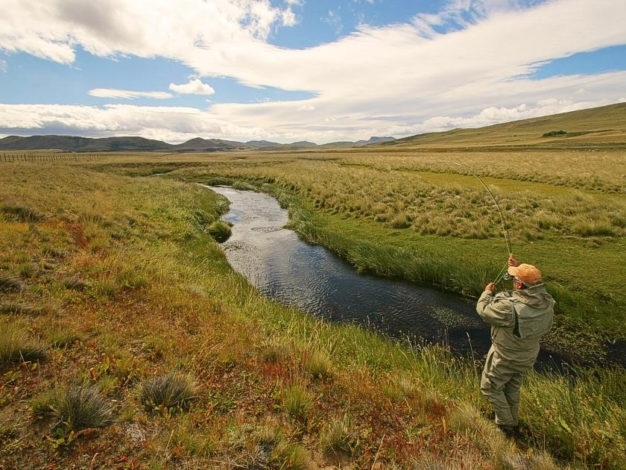 The Coyhaique area was the original, and is still the most classic of Chilean flyfishing destinations, surrounded by an incredible diversity of fisheries for which this area became famous years ago. 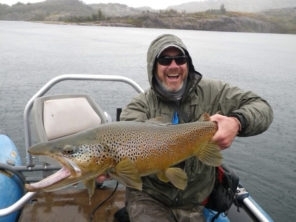 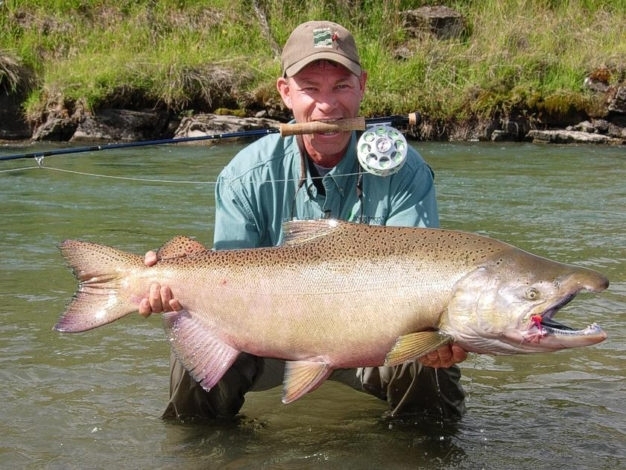 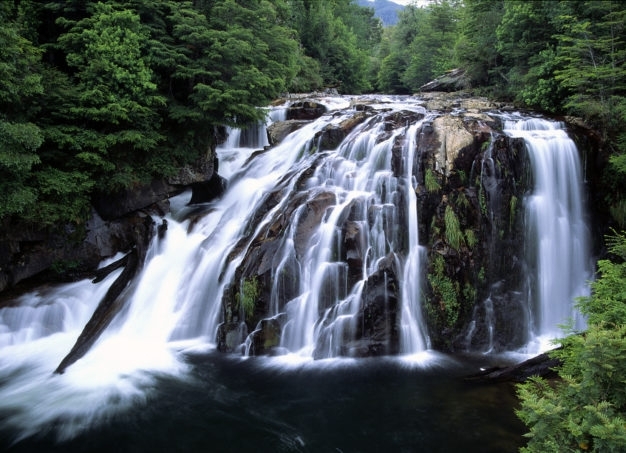 Rainbows, browns, and brook trout all ply its waters alongside native species like the perca, and there are more than occasional appearances made by sea run king salmon every year as well. 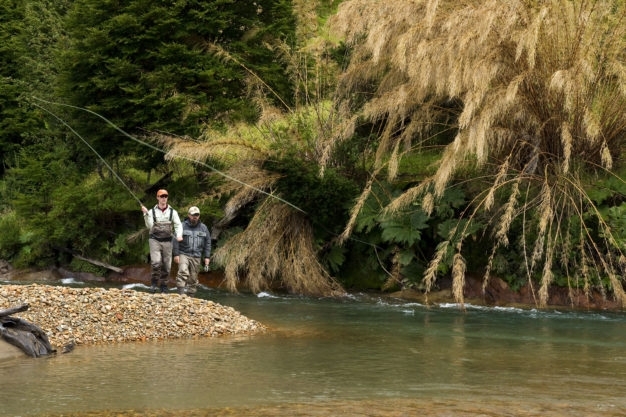 Guests at Cinco Rios enjoy a wide variety of waters on both the Chilean and Argentine sides of the border, most of which are within a half hour’s drive over typical Patagonian gravel roads. 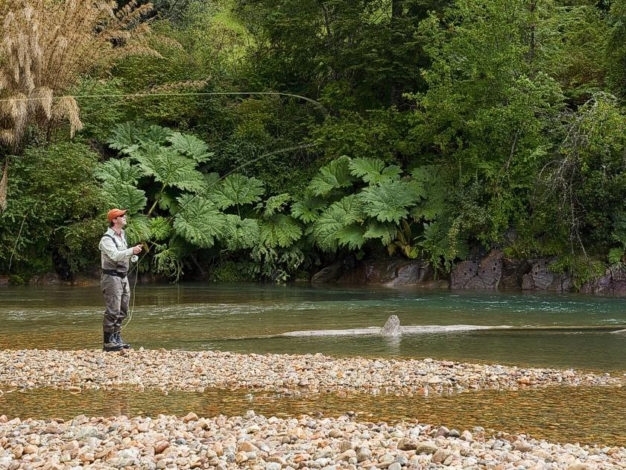 Many of the Lodge’s private small stream waters either don’t have names or are kept somewhat secret, but Megote, Guillermo, De Leon are public freestones also well worth a visit. 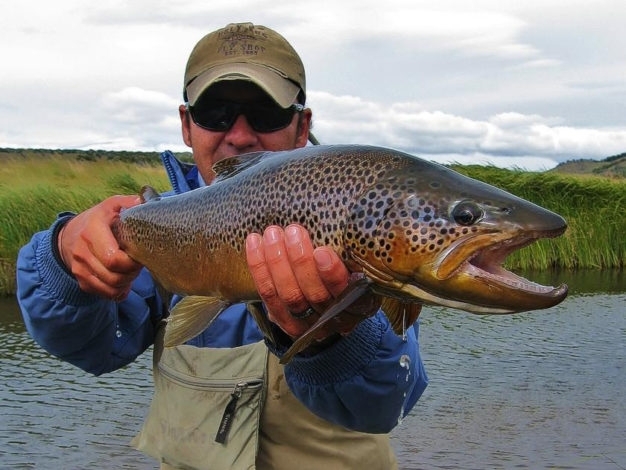 In addition to these, guests also fish public waters such as the famous Rio Simpson, the La Paloma, the Aysen, and the Mañihuales, as well as the outlets of Lagos Desierto, Azul, Frio, Elizalde, Castor and Pollux. 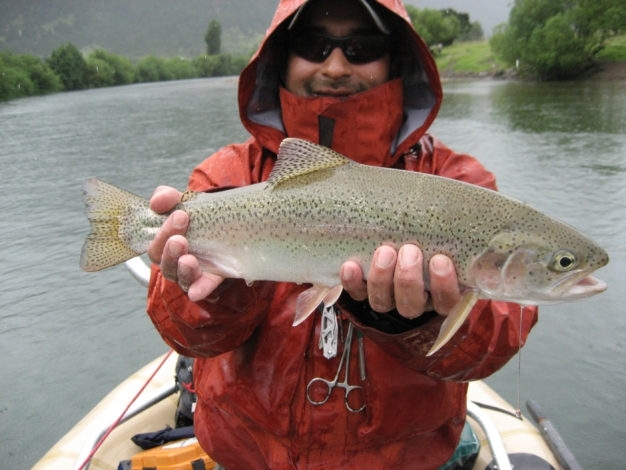 A typical week long itinerary includes two jet boat days on larger rivers, two rafting float trips, and two days of wading on smaller streams. 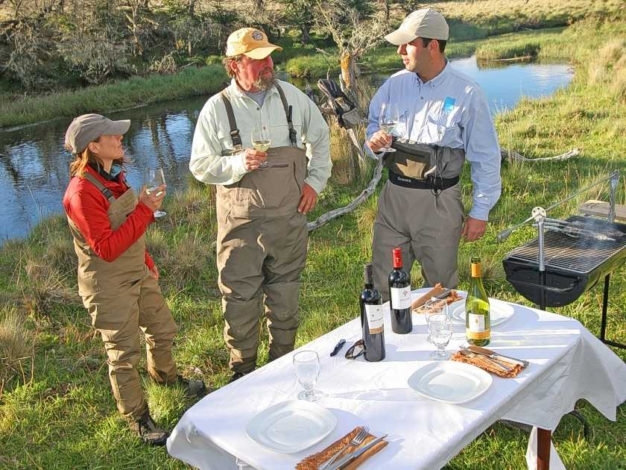 Cinco Rios guide staff is made up of locals with years of experience on these waters, and the lodge prides itself on the exceptional inventory of boats, vehicles, and equipment they use out in the field each day with clients. 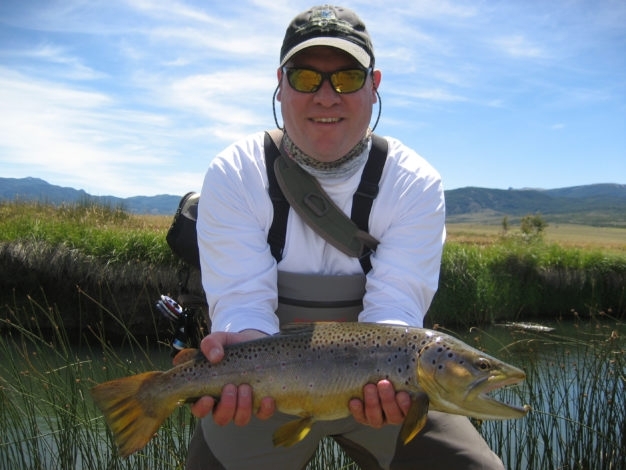 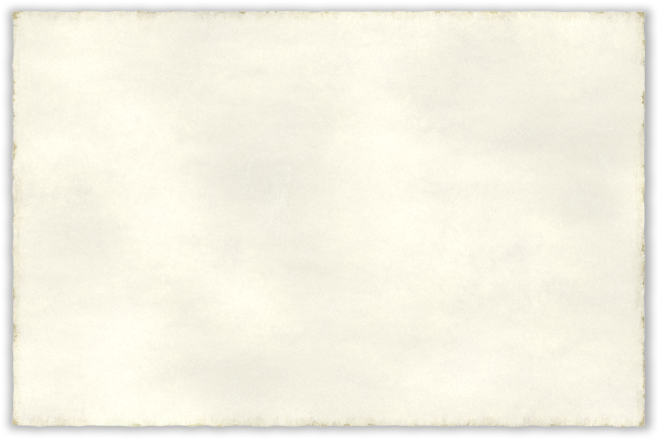 A limited inventory of loaner gear is also available for clients who need to travel without much baggage, and a small fly shop is also available at the lodge. 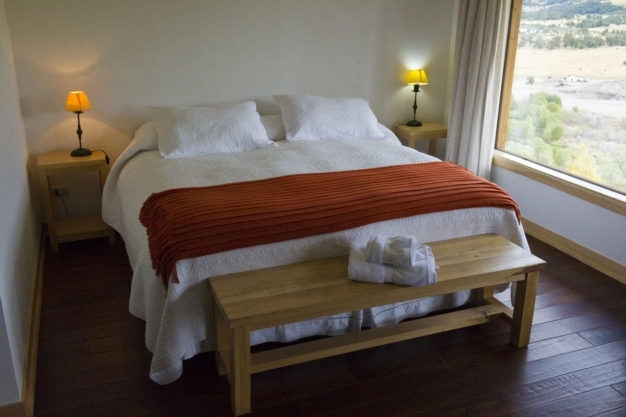 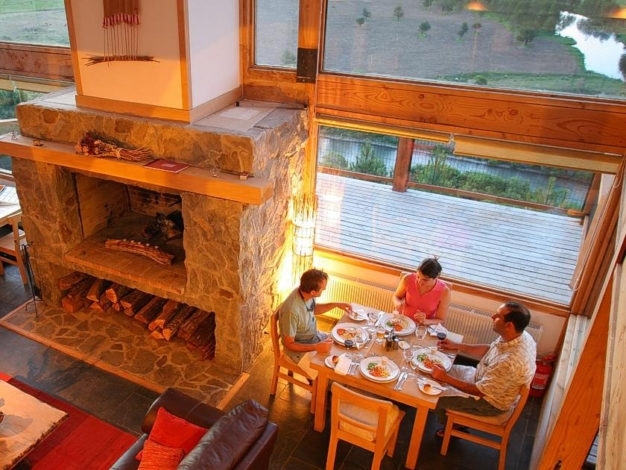 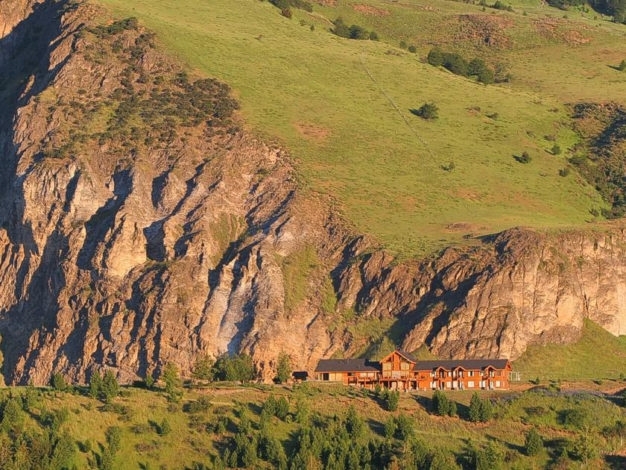 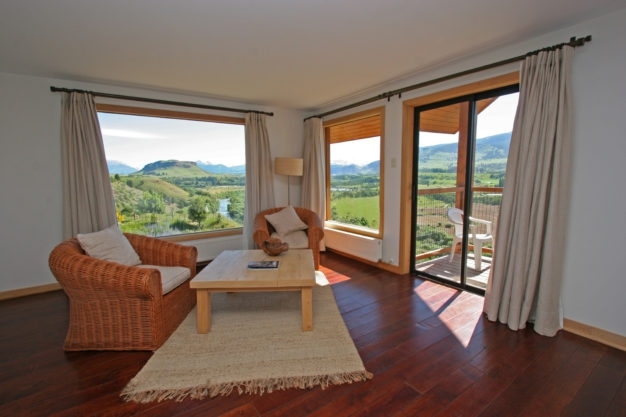 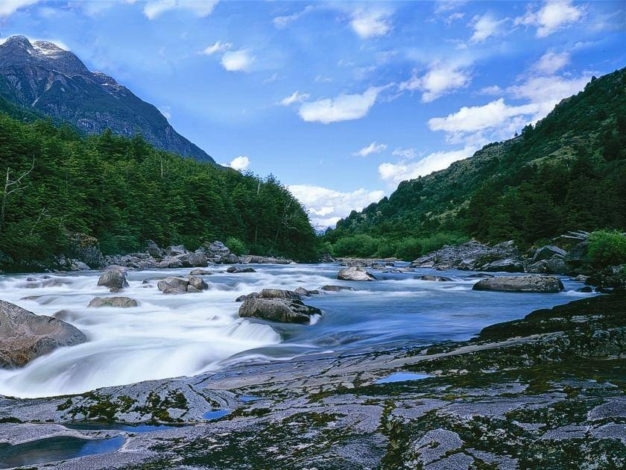 Cinco Rios Lodge is situated right on the Simpson River just outside Coyhaique, Chile, in the region of Aysén. 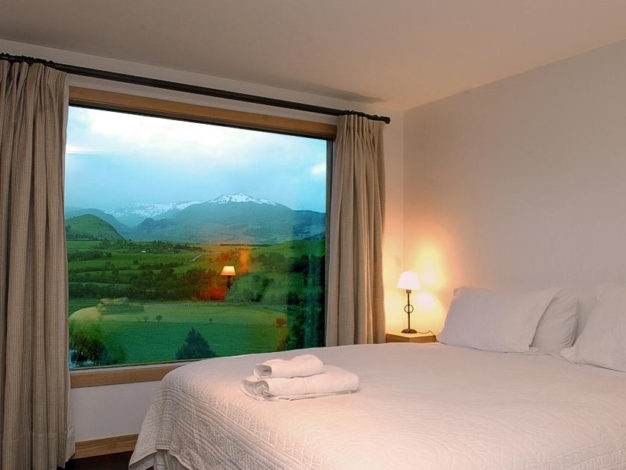 Each guest room offers its own spectacular view, and is furnished with two beds, local artistic décor, and its own private bathroom. 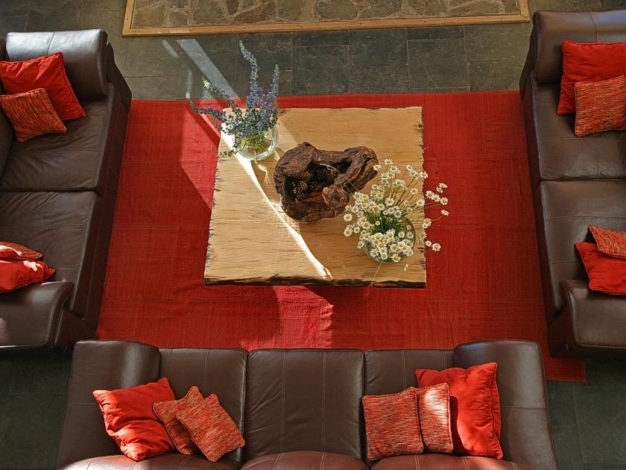 Common areas include a large great room with an impressive fireplace, a separate dining room and fully stocked bar, a television room with satellite service for any games that just can’t be missed, a tackle and gift shop, and even a meeting room which can be used for the obligatory by any corporate groups. 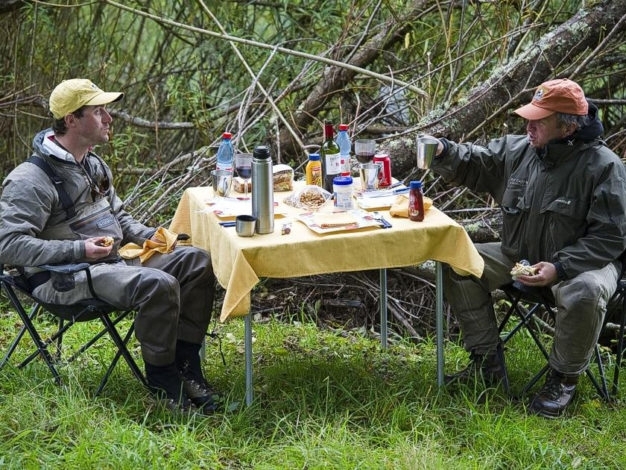 A separate wader room also features private lockers and wader/rod racks for each client. 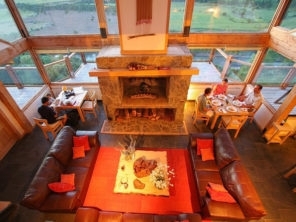 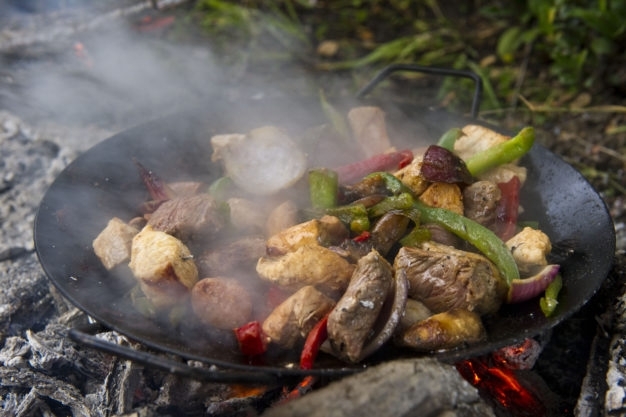 Meals at Cinco Rios are prepared by the lodge’s own executive chef and culinary team, featuring mostly organic local ingredients including free-range Patagonian beef, chicken and lamb, wild mushrooms from Estancia Zorro, fresh fish from the nearby Pacific, and herbs and vegetables from the lodge’s own on-site gardens. 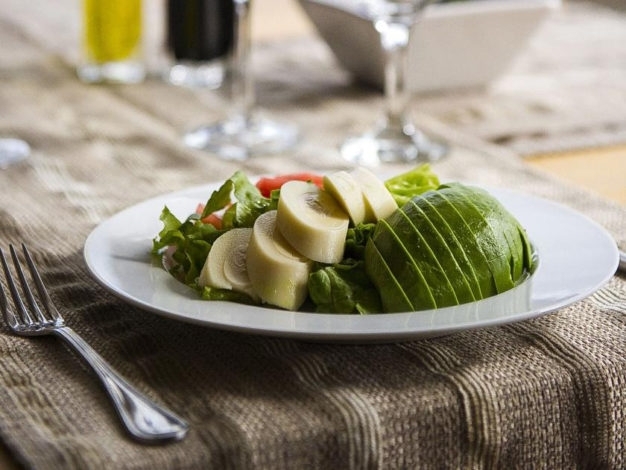 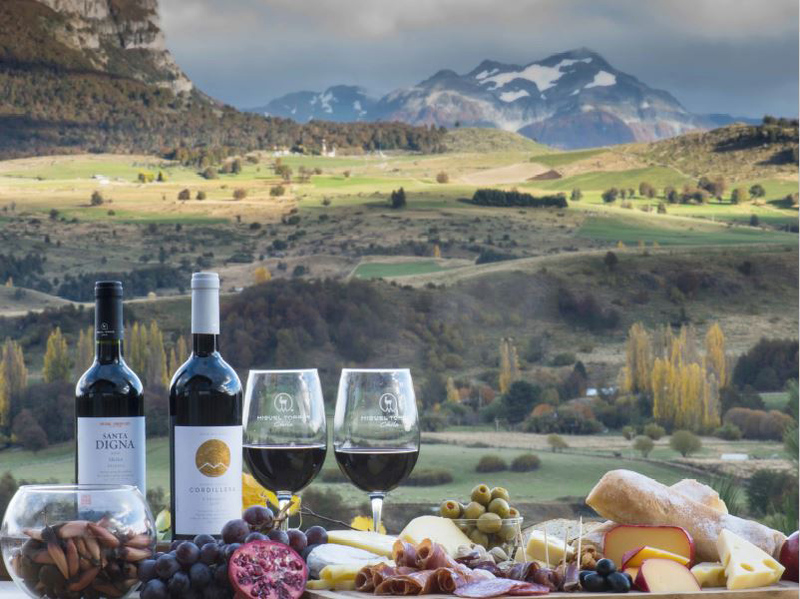 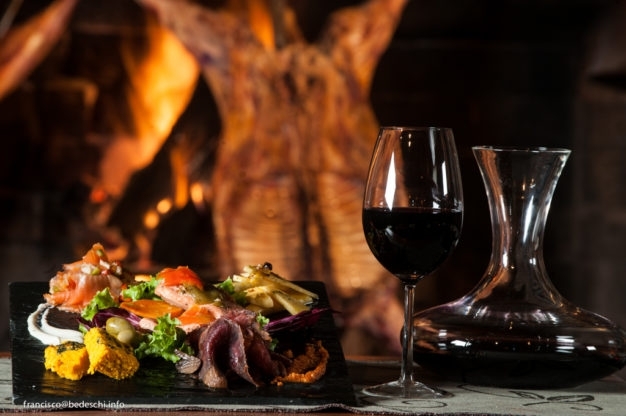 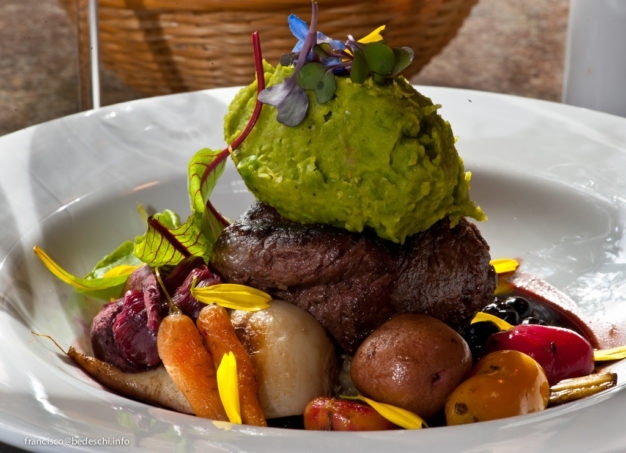 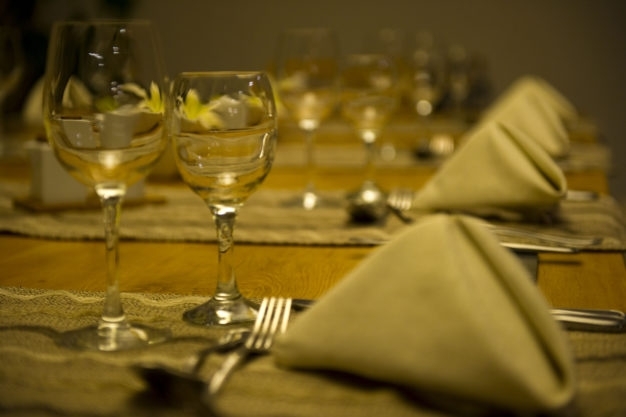 Classic Chilean dishes are fused with internationally influenced designs to create amazing meals with which to enjoy the impressive selection of local wines also offered. 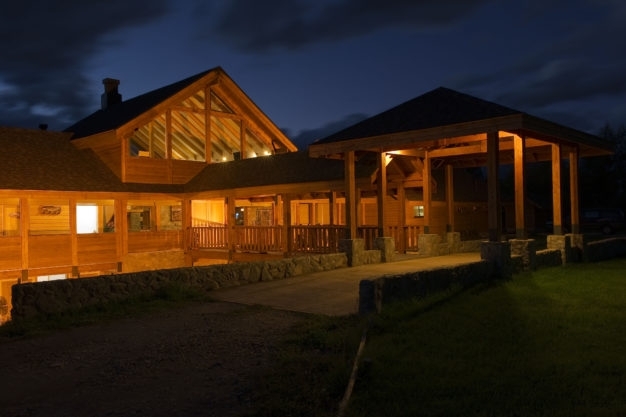 Flights for our Cinco Rios Lodge program arrive and depart from Balmaceda airport (BBA) near Coyhaique, Chile, generally via connection through Santiago (SCL). Overnight flights from the United States to Santiago are available on American Airlines, Delta or Lan Chile. 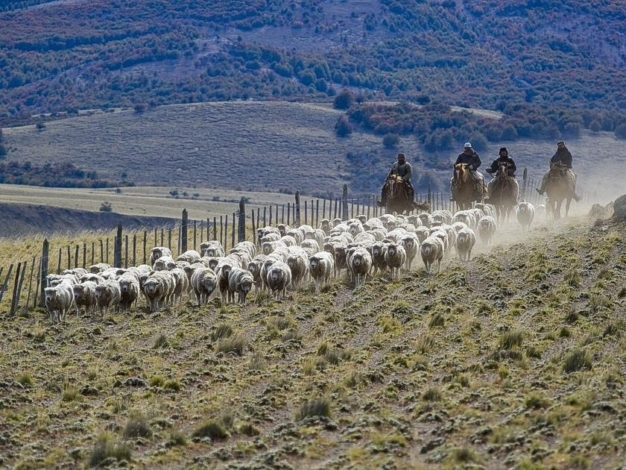 Then from Santiago the LAN Chile flight takes about three hours to arrive at Balmaceda, where a representative from the Lodge will be waiting to accompany you on the 45 minute ground transfer to the lodge. 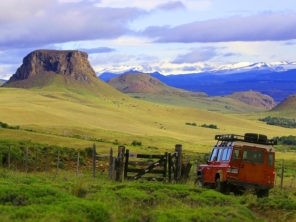 A valid passport is required to enter Chile, and citizens of the United States, Canada, and the UK do not need a visa for stays of less than 90 days. 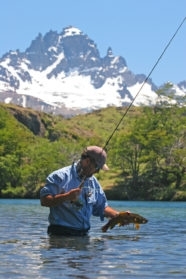 Cinco Rios Lodge is open every year from December 15th to April 15th. 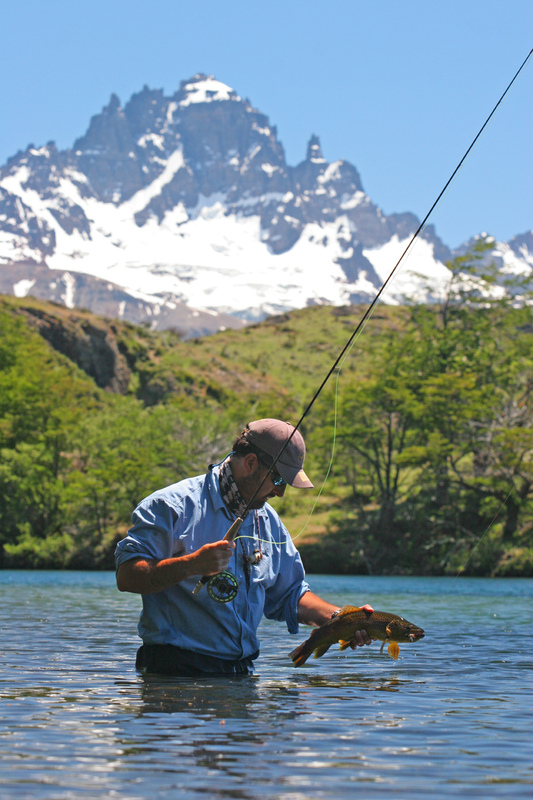 Package rates (quoted in US dollars) are per person based on double occupancy, and include everything except flights, fishing gear, and guide/staff gratuities. 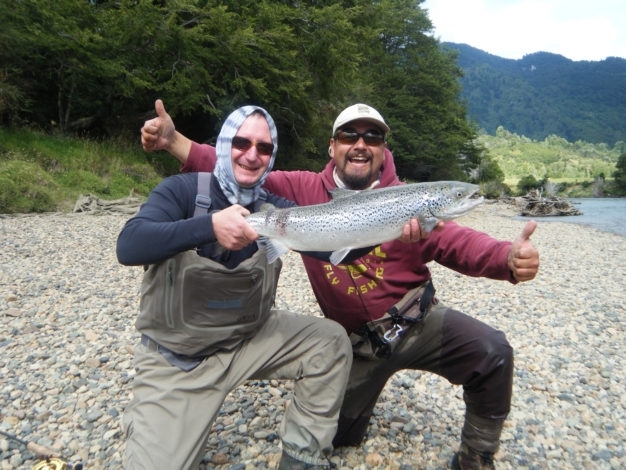 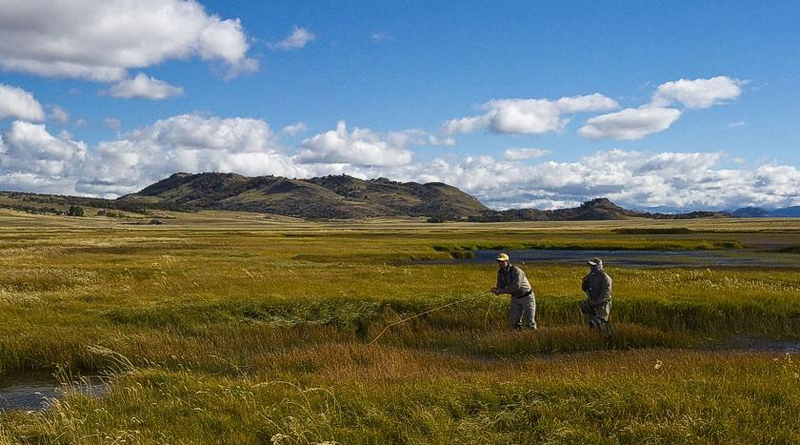 Contact us today for available dates and details, and get started on your way to this dream-trip of a lifetime to experience the most classic region of Chile's fly-fishing-famous Patagonia!